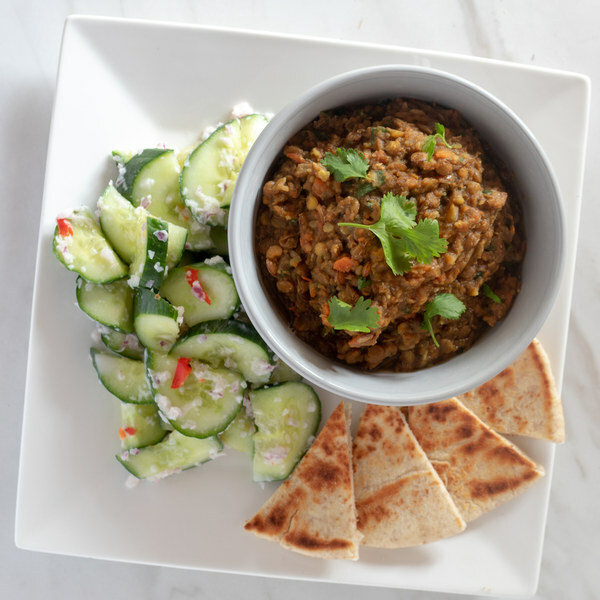 ← Curried Lentil Dal with a Cucumber Salad. Rinse lentils under cold water and transfer to a medium saucepan. Add broth and spices; stir and bring to a boil. Lentils should be covered by about 1 inch of liquid; add water if needed. Trim off and discard the ends of the onion and remove the outer layer; small dice the onion. Add ¾ of the onion to the saucepan with the lentils. Put the other ¼ in a blender. Peel, and small dice the carrots. Small dice the tomatoes. Add both to the saucepan with the lentils. When lentil mixture comes to a boil, stir, cover with a lid and turn to low heat. Simmer for about 20 minutes or until lentils are tender. Trim and discard the ends of the cucumber; halve the cucumber lengthwise, then thinly slice crosswise on an angle. Transfer to a small bowl. Warm the whole chili in the preheated skillet, 1 minute per side. Remove the stem and add chili to blender. Turn the skillet to medium low heat. Juice the lemon and add the juice to the blender. Blend with onion, chili, mustard, sugar, salt, and yogurt. Transfer to the small bowl with the cucumber. Gently mix until evenly coated. Place naan bread in skillet, toasting both sides, about 1 minute per side. Using a knife, shave the cilantro leaves off the stems at a downward angle, working away from your body; discard the stems and finely chop the leaves. Put aside in a small bowl. Once lentils are tender, give them a quick pulse with an immersion blender. Stir in half of the cilantro. To serve, ladle the lentils into a bowl and garnish with the remaining cilantro. Serve with the toasted naan and cucumber salad on the side. Enjoy!